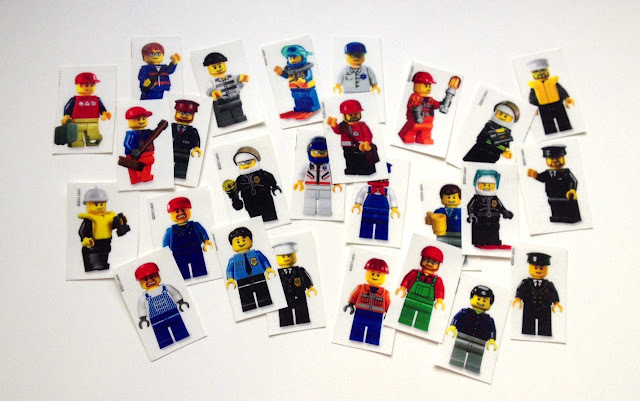 Welcome to the second instalment of ‘The Lego Party’! I like to have “stations”. Mostly because it takes the pressure off me but also because it cuts down a little of the awkwardness when you first arrive at the party and not everyone is there yet to start any group games and you can just get right into the fun! If you’ve seen any of our other parties, you’ll know that we do this set up often! There were a lot of kids at this party (27 in the end – what on earth was I thinking?!) so we had lots of stations and only 2 organised group games. Sounds a bit formal doesn’t it, but it was really a very relaxed, play whatever takes your fancy, kind of set up. 1. Lego Tattoos – I actually made my own tattoos. I still love saying that! These ones were made by photocopying a page from a sticker book onto tattoo paper. You can find a full tutorial here. 2. Lego man colouring table - I just googled ‘lego man printable’ to find this pic. This activity was surprisingly popular with both boys and girls. 3. 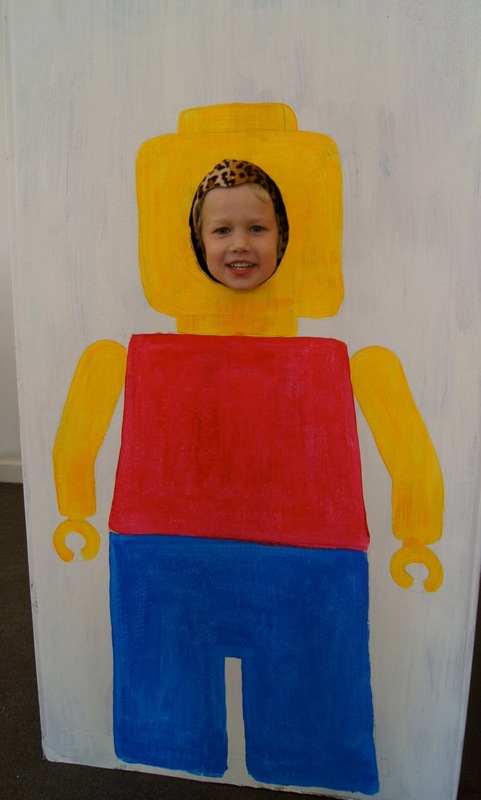 Free play with Lego - I was so impressed with the things the kids created! Many thanks to my mother-in-law who purchased the giant bargain bag of mismatched lego earlier this year! 4. 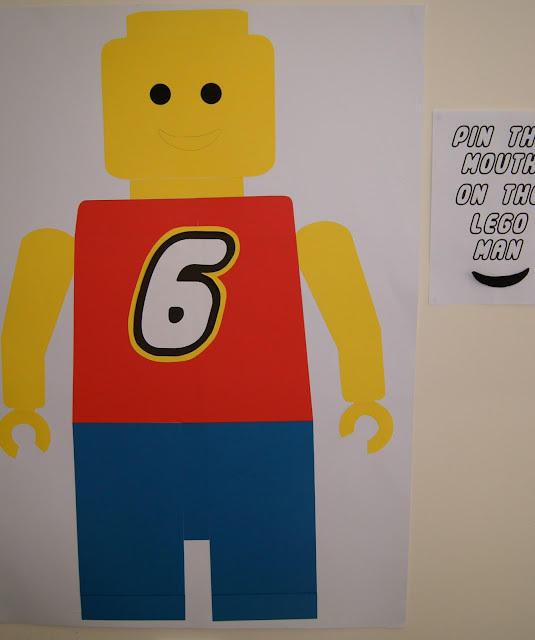 Pin the mouth on the Lego man - thanks to the great artistic skills of my friend Jess for helping me make this baby! Made with coloured card stuck on a large piece of card. 5. Lego Straw game – move the Lego pieces into the cup only using a straw. 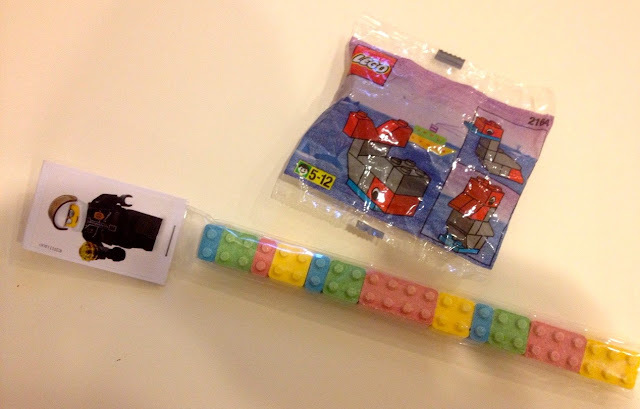 Tip: small lego pieces and bendy straws made it a little easier for this age group. 6. Lego Toss - How many lego pieces can you get to land in the plates. Can you tell that it’s meant to look like a giant lego brick …. ? Probably should have given the kids a chance to score points and get prizes for this one, but ran out of time to organise it properly. Not sure anyone minded though. Pass the Parcel - We play this game a little differently than most. There is no music and an activity written on each layer. For eg. the person wearing the most items of clothing, the person who can stand on one leg for the longest, the person who has the next birthday, the person who can make the funniest face. The person with the parcel at the time is the judge of that round. In the pic below they are all doing crab impersonations! Lego Hunt – Goose hid Lego all through our garden – front, back and sides. 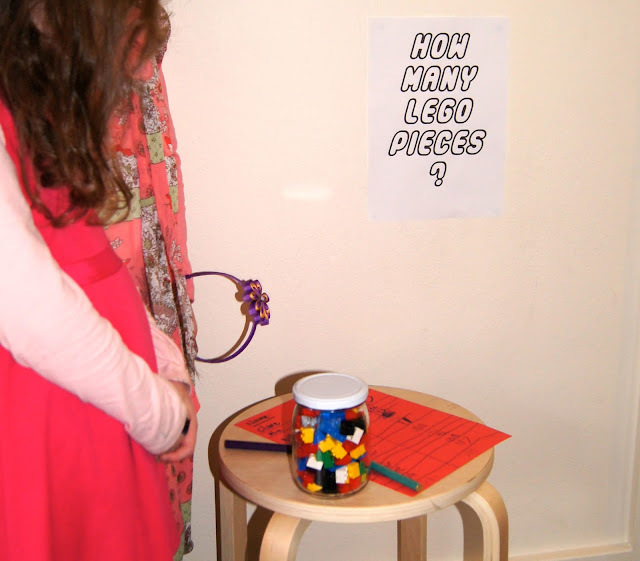 Each child had to find four pieces of Lego – one of each colour – and exchange it for a small prize. 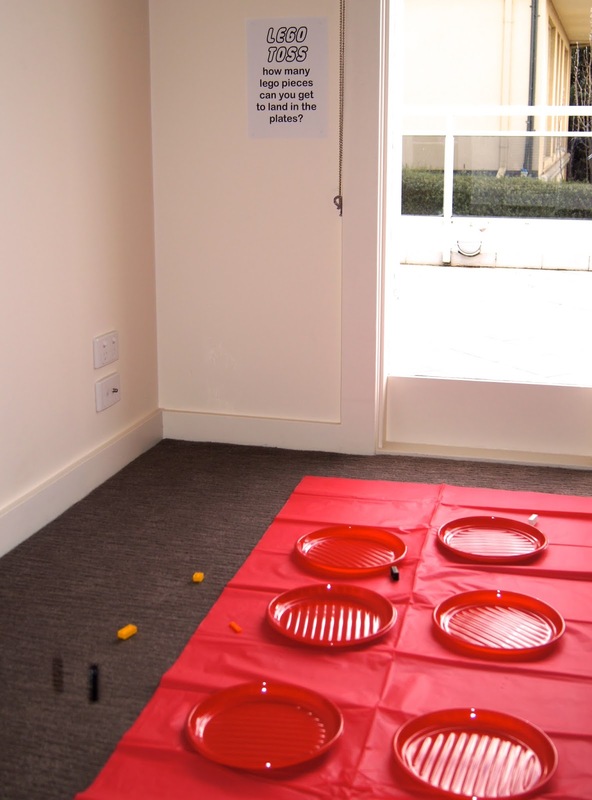 A simple, but fun, game to get them running around and to tire them out a little! The prizes for the lego hunt were chocolates that I made using a fantastic Lego man mould that I borrowed from a friend. I forgot to take a picture of these on the day, so this pic below is of the ones that we made for Bear’s school friends on his actual birthday last week, all individually wrapped. Tutorial on how to make these here and I just used white chocolate and yellow gel food dye. I’m pretty sure they sell the moulds on ebay. The take home goodies were simply a small lego set (a bargain on ebay) and some candy Lego bricks I purchased on my recent trip to the US that I popped in a treat tube (my new favourite thing). 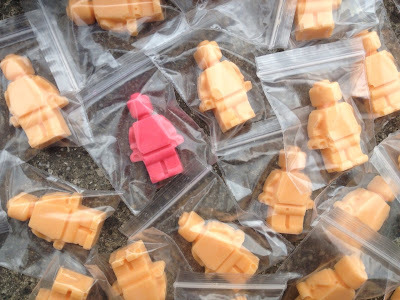 You can find part 1 of the Lego Party here with the pics of the food & decos and pics of the invites & party prep here. If you have any questions about preparing your own kids party, don’t be scared to ask – I’m always happy to help if I can! What an amazing party.. Looks like all had the best time.<br />Can&#39;t believe now much the kids have grown…. I want to come to your parties! What a great idea doing stations, so much easier I&#39;d imagine and less space and resources needed. Imagine having to have enough colouring pencils for the whole party to do that lego man design at one time!<br /><br />Bet you&#39;re glad it&#39;s all over now though. How long until the next birthday? Oh I miss little boy parties. I&#39;m destined only for princessy ones from now on I fear. <br />The big fellas just want to go to movies and such now. <br />Ah well…I can still enjoy yours. Love your version of pass the parcel! So many clever ideas! I might have to have go at making some tattoos. Hi Emma, What great ideas you have here. All very inspiring! Your parties are just fantastic… Thank you for posting more great ideas that make me feel excited about my son&#39;s upcoming birthday instead of dread!!! Great ideas! I threw a Lego party for my 7 year old in July and had a ball. Those Lego moulds made the food fun and there were heaps of great party supplies on line. Wish I had seen your post a few months ago!